Both concepts are already very similar. Solana Beach's San Diego Beerworks, located at 437 S Highway 101 Suite 107, will soon become the fifth branch of the popular San Diego-based craft beer tasting room and retail shop Bottlecraft, which currently has locations in North Park, Little Italy, Liberty Station, and Virginia Beach. 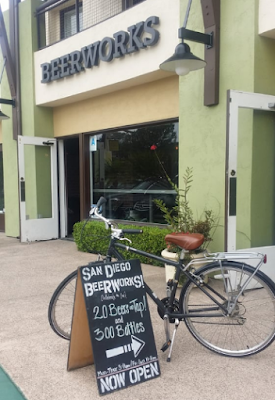 John Holko and Jennifer Todd opened San Diego BeerWorks in June 2014, offering patrons a craft beer tasting room with 20 taps and over 300 bottles for onsite consumption or take away, as well as a menu of small bites. The 1,600+ square-foot space is in the process of being taken over by Brian Jensen, who also has an ownership interest in Waypoint Public, for the opening of his fifth Bottlecraft. Being that the concepts are already nearly identical, not much will change. The eatery component will be revamped to offer a menu of shareable items, likely similar to dishes offered at Waypoint. We reached out to Bottlecraft's Brian Jensen for comment but have yet to hear back. We will update this story when we learn more. Until then, visit bottlecraftbeer.com for more information.